The Commercial value of Culture… I have seen the light! If you’re a ‘take things in your stride’, ‘cross that bridge when you come to it’ kind of person, then I have to admire you. Unfortunately (for my sanity), I am a Mystic Meg type whose brain never fails to leave me a little anxious after conjuring up yet another future life plan out of nowhere- some realistic and some not so much…hopefully lonely cat lady is one of the latter. Maybe I just need to take a chill pill. I prefer to think of it as ‘organised’ and ‘forward thinking’. Whatever the case, with an imminently approaching final year, the little crystal ball in my head has been hard at work turning my mind to post- graduation possibilities. Today was the penultimate day of my dissertation placement at Truth Consulting and I have mixed emotions. I won’t miss the 6:30am trains and I sure won’t miss the rush hour fight for a space on the tube, but I’m definitely going to miss the incredibly hilarious and talented people I’ve been working with for the last two weeks. Ultimately I’ve learnt so, so much over such a short period of time and this is my attempt to summarise it. Enjoy! Particularly amongst the younger generations, but increasingly within older generations, social media is becoming a more and more relevant part 0f our day to day lives. We tweet news stories, like other people’s activity, and follow the accounts of the ones we love. Social media is a way of communication, a way of being in the now no matter where you are in the world or what time it may be. Academics within the field of Geography and Sociology speak of a shrinking world, whereby technological advancements, namely social media, result in larger or imagined communities, whereby relationships can span over a wider, seemingly unlimited space. It’s not uncommon for people to meet each other online, communicate with loved ones from thousands of miles away and even share pictures and videos in real-time; social media can no longer be thought of as a ‘new’ touchpoint. It enables powerful and compelling content to be engaged with by a diverse base of people, and brands need to take advantage of this. I’ve had a lot of interest in my project subsequent to my last blog post which has been great – unless you are all just being nice. I’ll take it as the former. With all this attention I was hoping to find a kneeler devoted to Europe for a chance to spontaneously pontificate my political views on the EU referendum. Fortunately for you no such kneeler has been found so instead of economics, bureaucracy and immigration, you will be lectured on culture, geography, and textiles. Me, Guildford Cathedral, kneelers and … a Hovercraft? Seeing as I started my placement last Thursday, I’m a bit late with this first blog post, but all I would’ve had to talk about was how I have learnt the hard way why people who commute get grumpy. Nevertheless, any chance I get to wear a blazer and brogues I will grasp with both hands and now that I’m not driving a Corsa which is as old as I am, I genuinely feel like I’m ‘growing up’ a little bit. Throughout this experience, there have been high points and low points, but there’s always something to counteract the low points. The caramel hot chocolate has regularly been my cure and pick-me-up after two hours of sitting on a picnic blanket in the cold and sheltering under a large umbrella with all my research notes to protect them from the rain. People (and animals) seem to have found my research interesting: when I’m preparing the hessian sacks, the yard cat is often very inquisitive; on some days people (both visitors and keepers) have come up and asked me what I’m doing – and have genuinely wanted to know about my dissertation, which has been lovely, everyone has a story or piece of information to share. 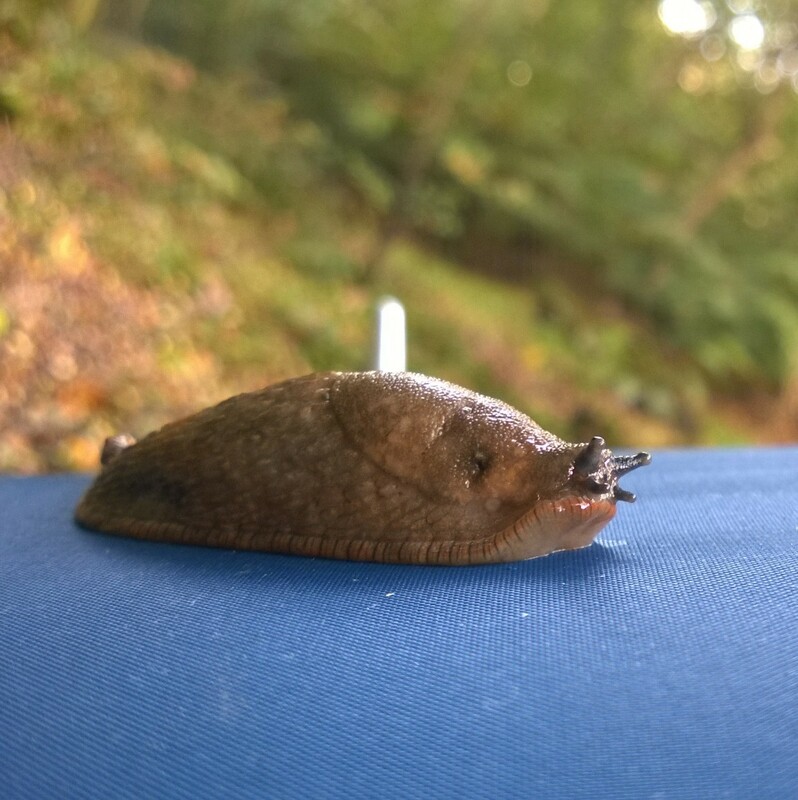 On the cold, rainy weekdays however, sometimes the main company I have are the slugs (not a high point!). Those are the days that even Cara and Shria want to hide in their sleeping quarters. My company for my research. This placement has taught me so much about these amazing creatures, and how much the public are fascinated by them. It’s wonderful to think that despite all the technology we have nowadays, and everything that can entertain us, we can all relate well to nature, regardless of age or background. It’s no surprise we find the lynx so endearing. They are strong, and people are aware of this enough to know that they need to be respected as animals, which is so clear at certain times, such as when they’re feeding or leaping. But they are also cats, and sometimes their behaviour isn’t so unlike that of our pets. This video shows one of the last repeats I carried out for my research, and I don’t know why they reacted in this way, maybe they were just in a playful mood, but whatever it was, it shows how similar all cats really are (this does not mean I recommend having a pet lynx). One of the leading questions posed in the debate over rewilding is “can we cope with a wilder Britain?” and I’m starting to think that given enough time, yes, yes we could. We have lived amongst nature before, and, whilst there are exceptions, most people have respect for animals such as lynx, which surely is able to grow and improve over time. 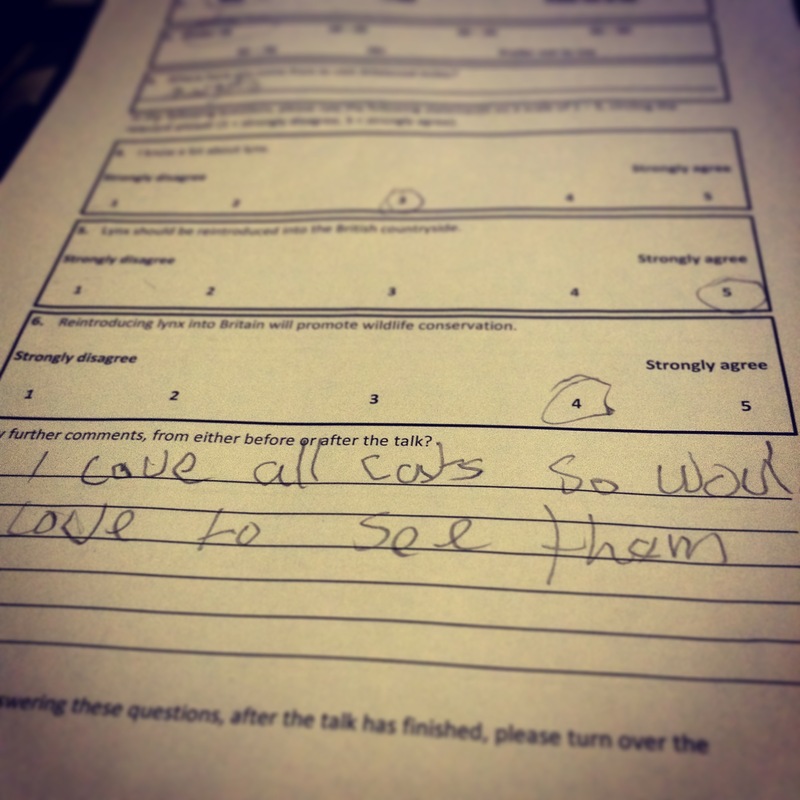 “I love all cats” – The perks of asking the public for their opinion. I’ve been down to Wildwood a number of times now, and been able to hand out questionnaires as well as do my experiment. There’s two parts to my questionnaires, one side is to be answered before the lynx keepers’ talk and feed begins, and the other side afterwards. Whilst the plan worked in theory, in reality, it’s not so good. People don’t always to think on their day off. I admit, this is a sweeping statement, and plenty of the people I have asked have answered the questionnaires as hoped. Even when they haven’t followed the instructions exactly, they’ve still taken the time to help me, and I definitely appreciate it! However, as always, there have been mixed responses, clearly showing how some people don’t tend to listen to the information provided. My favourite of these has to be “If re-introduced to the wild, would they not attack people?”, which is a genuine concern amongst the public, although, with improved education and awareness of the species, this could be corrected. A number of respondents were also clearly concerned with the Scottish independence referendum, and wanted lynx to be in England, not Scotland despite a lack of suitable habitat. The questionnaires are only part of my research though, and I have the fantastic opportunity to do an enrichment-based experiment on the two lynx as well. In my last blog post, (available at: https://rhulgeogplacements.wordpress.com/2014/09/09/starting-my-placement-at-wildwood/), I spoke about what my experiments entailed, but at that time, had not had the chance to start them. By the end of my placement, I will have done 10 repeats of the experiment, and it will hopefully show that the lynx have a preference for either deer or sheep to prey on. The video below shows part of my experiment (despite the poor quality and my lack of editing skills!). The hessian sack furthest from the fence contains a mix of sheep dung and straw, whilst the closest is the roe deer dung and straw mix. Here is a far better quality video of the lynx at Wildwood from an episode of BBC’s Countryfile in 2011. To finish of this post, I just want to thank Wildwood for their continued support of my project. Please go to their website (www.wildwoodtrust.org) and look at the recent work they’re doing, including fundraising £50,000 to rescue two brown bears that are currently being kept in awful conditions. I have now reached the end of my time at StreetInvest, and honestly, I was very sad not to be returning there this morning. The staff and volunteers there were so welcoming to me, and I have learnt so much, about StreetInvest and their work, about the complexities of supporting street children and about what it’s like to work in an NGO. StreetInvest have put me in touch with some brilliant people and organisations who are all working towards supporting street children, and thanks to that, I’ve organised several interviews and have sent questionnaires to others, both in this country and worldwide, which means that the dissertation is definitely underway! I’ll be asking them about how their organisations seek to support street girls and whether those street girls are included in other women’s movements internationally. In modern literature, street girls are seriously underrepresented. This is partly because they are more difficult to see visibly on the streets and because they are often more difficult to support. I know that my undergrad dissertation isn’t exactly ground breaking research, but it feels amazing to be adding to the discussion surrounding these girls. But this isn’t the end. In fact, this is only the start! It’s the start of my dissertation really getting going, as I start to analyse the information I receive. And then, on a personal level, the last two weeks has completely confirmed for me that I would like to work in the NGO sector, and that my passion lies with helping the world’s disadvantaged children. I really hope that I will be able to keep in touch with StreetInvest and everyone who works there, as it’s an inspirational place! If you’ve enjoyed reading this blog, and Nat’s blog about his placement at StreetInvest (which I hope you have! ), I cannot encourage you enough to check out the website or get in touch with StreetInvest at info@streetinvest.org. The staff and volunteers will be very happy to give you info on how to help the charity to help street children across the globe. Thank you StreetInvest and thank you for reading!